The Evidence: Do Face Exercises Really Work? The relationship between the resting tongue position and the shape of one’s jawline has been a much-speculated topic online. Although we always need to be wary of junk ‘alternative’ science, the ideas put forth by Dr. Mike Mew and the field of orthotropics piqued our interest. Not only are they plausible, but they’ve achieved considerable results for users. The proper tongue posture technique developed by Dr. Mew has become known as “mewing.” Does mewing even work? Can it give you a more defined jawline and profile? Let’s investigate. Who Is Dr. Mew and What Is Orthotropics? Am I Too Old to Start Mewing? Mewing is a proper oral posture technique which seeks to better the orientation of the face and jawline by altering your unconscious, resting tongue position. Mewing is in effect training your tongue to rest on the roof of your mouth and make it part of your muscle memory. As someone who did not find this intuitive at first, I was surprised over how many people did already rest their tongues on the roof of their mouths. This just underscores the fact that incorrect tongue posture is an abnormality which destablizes the opposing forces of the mandible and maxilla (the lower and upper jaw). It results in mouth-breathing, a longer face, a more hunched poise, and an overall worse appearance. Before we get into specifics, let’s get one misconception out of the way right off the bat: mewing is not a new trendy thing in cosmetics to make you instantly look better. Rather, not mewing is the modern phenomenon making people’s appearance worse. Mewing is simply the corrective therapy aimed at bringing our tongue posture back to what it should be. Dr. Mike Mew himself is an orthodontist trained in London where he manages his own orthodontic clinic. He is a third-generation dentist who received his orthodontic training from Aarhus University in Denmark under the mentorship of Professor Birte Melsen. Throughout the 1990s, Dr. Mike Mew was a practicing dentist at the Royal London Hospital. Dr. Mike Mew’s father, Dr. John Mew, is credited with beginning the field of orthotropics. In the last decade, mewing has been popularized in large part by his son. Orthotropics is a branch of medicine that follows the philosophy that one should treat the face rather than just the teeth. The field has significant overlap with the existing field of myofunctional therapy, a holistic approach which treats disorders of the face and mouth. Orthotropics is represented internationally by the International Association of Facial Growth Guidance (IAFGG). For those that follow orthotropics, abnormal alignment of the teeth is also a problem of the face and can be fixed by correcting the facial resting position. Orthodontistry, on the other hand, might instead propose a retainer for the rest of one’s life as a treatment option. It’s understandable then why orthotropics has butted heads with orthodontistry over these disagreements about treatment options. Many who are orthotropic specialists are also trained orthodontists, however, and the two fields should not be viewed as in opposition to one another. If you’re now realizing that you’ve been resting your tongue on the floor of your mouth unconsciously and want proper tongue posture. If you’re mainly a mouth-breather. If you have a ill-defined jawline and want to improve your face. If you have difficulty swallowing or obstruction in your breathing. If you have a narrow palate and teeth crowding. If you have a mild underbite. If you want to appear more confident and correct your overall posture. Mewing is simply resting your entire tongue on the roof of your mouth until it becomes an unconscious resting position for your tongue whenever your mouth is closed. Yes, that’s really it. But it’s a lot easier said than done. To do mewing correctly you need to have your entire tongue on the roof of your mouth. That includes the back of the tongue too, so your tongue should fit right between your molars and wisdom teeth. This might even be tiring for you initially since your tongue muscles are initially weak. You should feel some pressure in your mid-face, chin, jawline, and palate if you are mewing correctly. The effects of mewing on your jaw are illustrated below. Mewing might seem a bit strange at first, even. You essentially have to retrain your brain to completely rewire its existing facial resting position. Tongue posture is a hard habit to break, especially if you’ve been doing it incorrectly all your life. The good news is that, after doing this consciously for weeks, it will eventually become like muscle memory and will get much easier. You will also see demonstrable improvements to your face during this time. For example, your face’s entire posture and orientation will be more symmetrical. You will feel your entire face come forward. It really is quite surprising how a simple proper tongue posture can do all this. But if you think about it, it makes sense: your tongue holds your mouth, and your face, in balance. Think of your jawline muscles and tongue as opposing forces which must be synchronized properly. Still confused over how to mew properly? Please read our Q&A guide for any other questions you may have. The main benefits from mewing come from correctly applying it to swallowing and drinking liquids. This is because it is through the act of swallowing that mewing applies a few pounds of force to your palate: this force is what will be responsible for expanding the roof of your mouth. To swallow correctly while mewing, simply press the tongue firmly against your palate while swallowing. Keep your facial expression unchanged. As you feel your thyroid rise with each swallow, you will feel your tongue press against the roof of your mouth. If you’re not swallowing correctly while mewing, you will not see results. You have to learn to swallow with your tongue. That’s what’s most important. It should also be noted that mewing should also be complimented by maintaining a proper, erect posture when sitting and standing. An upright posture is considered to be the secondary component of the mewing technique, thereby aligning your jawline and face with your chest. Both should be consciously done until they become like second-nature. The technique’s simplicity should not cause us to second-guess its proven track-record in correcting facial asymmetry, ill-defined jawlines, and sagging jowls. Coupled with working out the masseter muscle with the help of jawline exercises, mewing is a technique that will altogether strike a different balance in your face. The end result is a more balanced, lifted appearance with a defined jaw and profile. So, you might be wondering: where’s the proof mewing even works? Propeer tongue posture is nothing new nor was it invented by Dr. Mike Mew. It’s been part of dentistry for well over a century. Myofunctional therapy, which trains patients in correct swallowing and tongue posture, has been an established speciality for some time. 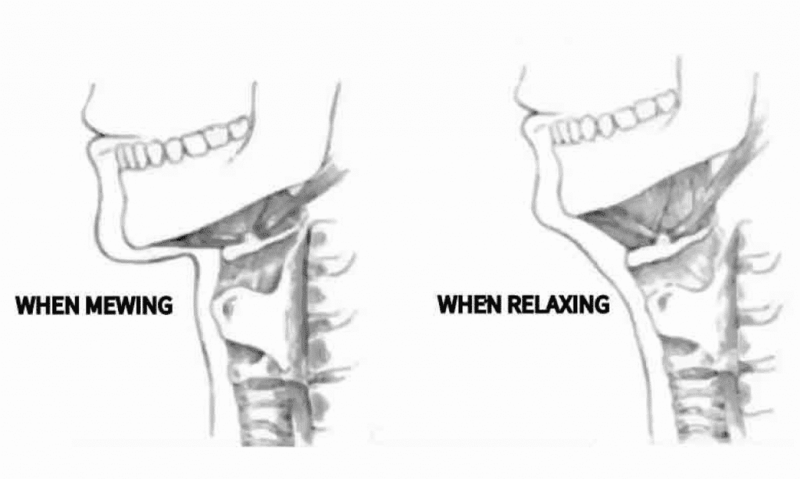 Although the oral posture technique is understudied, there have been some clinical studies done on the topic along with some first-hand accounts of its success. Contrary to what you may have initially thought, the skull is actually not one large bone. It is made up of sutures, the connective tissues between the skull’s bones. This means that the skull can in fact change over time. As an example of this, Dr. Mew mentions how motor neurone disease deteriorated the shape of physicist Stephen Hawking’s skull over time. Due to no muscle movement in his face on account of his condition, his entire skull sagged further and further downward with age and changed shape. This indicates there is indeed some elasticity in skulls. Because the skull is made up of all these sutures, mewing is actually about balancing the muscles in the face which can cause slight changes in facial structure. Ultimately, what holds the facial balance together is the maxila (or upper jaw). This is what your tongue will be pressed against when you are mewing. The changes to the face shape based on the position of the maxila is demonstrated below. There is a small, but growing, amount of evidence currently available on proper tongue posture. Take a look at them for yourself and draw your own conclusions. The topic of proper tongue posture still remains criminally understudied. In a study conducted in 2014 published in the Korean Journal of Orthodontics, the corrective tongue posture technique was able to correct an overbite and bring the entire face forward. 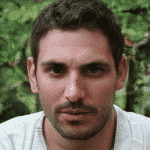 After a two-year relapse using retainers, the mewing technique produced lasting effects for 10 years according to the study. However, this particular patient used a tongue elevator to ensure that his tongue was on the roof of his mouth rather than stick to it himself. A 2018 study in the journal Radiology and Oncology found significant evidence for “tongue posture” curing anterior open bites in preschool children. The study recommends tongue posture techniques (like mewing) for early childhood development. A 1997 study published in the Journal of Oral & Facial Pain and Headache found tongue posture on the roof of the mouth to be linked to stronger temporalis and suprahyoid muscles, both required for mastication. In a 2010 study published the European Journal of Orthodontics, tongue-repositioning manoeuvre was found to reduce snoring in patients with a normal BMI when combined with an oral shield. In a “highly surprising” 2016 pilot study published in the Muscle, Ligaments and Tendons Journal, a proper tongue position on the palate was found to be linked to a “30% significant increase of knee flexion peak torque.” In other words, tongue posture is linked to the posture of your entire body. One commonly-cited piece of evidence (1999) cited by Dr. Mew is the case of the Creed twins. One twin underwent orthotropic treatment focusing on tongue posture while another opted for a traditional dental appliance. Just using a simple tongue posture adjustment, the outcomes were drastically different for each twin as show below. Two identical twins: one underwent proper tongue posture (mewing) at an early age while the other tried traditional orthodontic treatment with an appliance. There is still much clinical work to be done on mewing and proper tongue posture. However, some of this information provides us with concrete evidence that proper tongue posture has noticeable effects. The Dental Academy of Continuing Education lists in their course on muscle memory the importance of proper tongue posture. They define proper tongue posture as “the apex of the tongue should be resting just lingual to the maxillary anterior teeth and on the incisive papilla of the hard palate.” The course document cites: Hanson, M. L., & Mason, R. M. (2003). Orofacial Myology International Perspectives (Second ed.). Springfield, Illinois: Charles C Thomas. 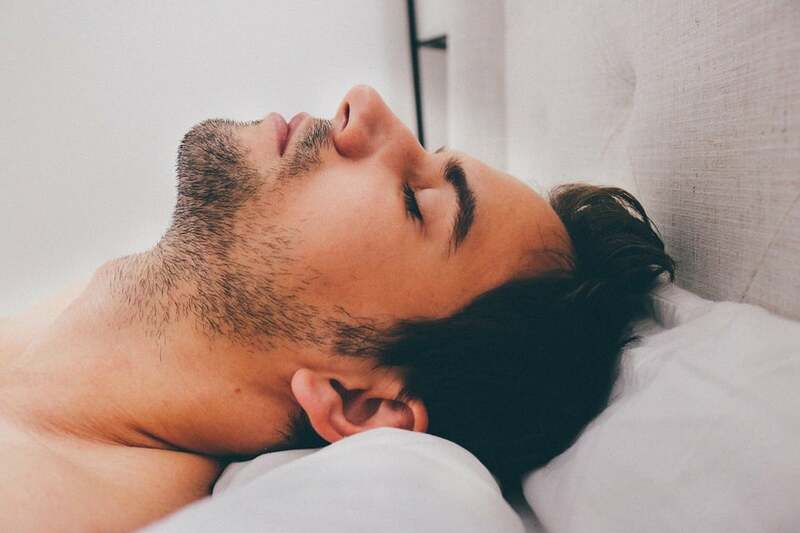 With 36 citations, this report published by the Oral Health Group finds mouth breathing to be intimately connected to low tongue posture. This interview with physical therapist Maryvonne Fournier, published in the Journal of Dentofacial Anomalies and Orthodontics (2008), discusses the importance of tongue posture in orthodontic treatment. Stanford’s biologist and population studies specialist Paul Ehrlich and orthodontist Sandra Kahn have recently co-authored a book Jaws which discusses the “hidden epidemic” of recessed jaw development. The book affirms the importance of proper tongue posture. Another piece of evidence we can look at is the before and after mewing success stories which have been posted online. Although anecdotal evidence should be met with skepticism usually, the growing amount of before-and-after evidence is becoming more and more overwhelming. Over a two-year period. Patient had tongue tie which was corrected surgically, then practiced proper tongue posture. 1 year after mewing (age 21 to 22). First posted on r/orthotropics. 22 years old. 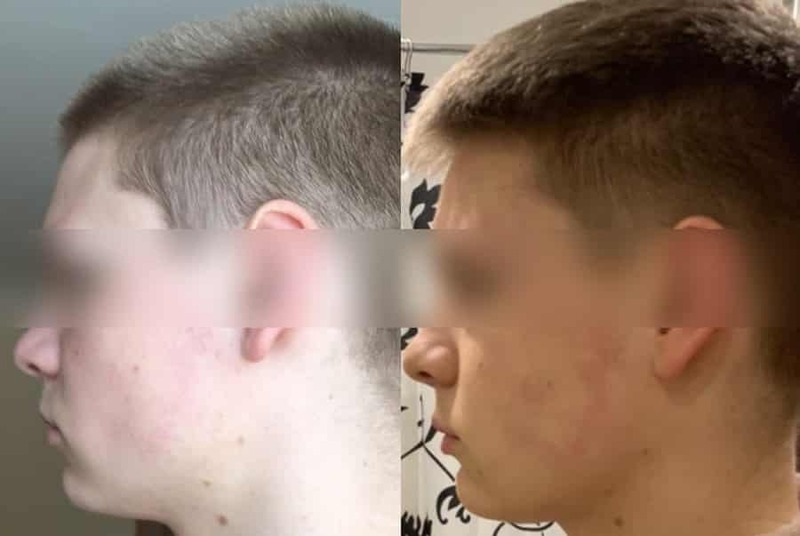 Face change after 4 months, posted on r/orthotropics. 15 years old. 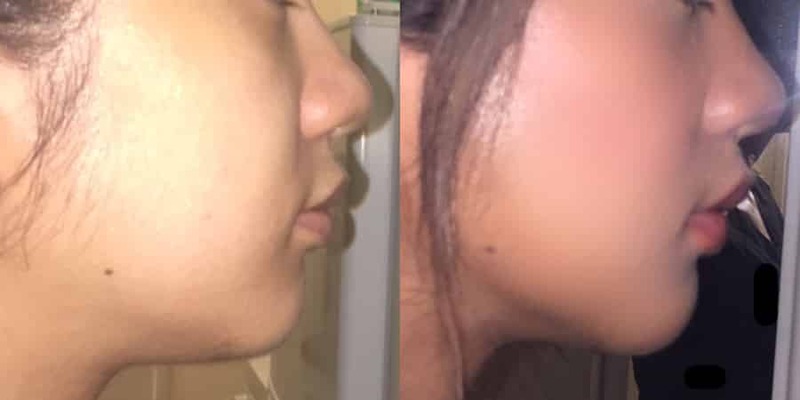 Face change after 6 months, posted on r/orthotropics. Face change after 3 months. 4 month of progress while mewing coupled with chewing gum and a healthier diet. 17 years old. Mewing for 4 months. 10-month progress with the mewing technique. The before and after photos of these mewing results definitely show some noticeable improvement. Because mewing is a corrective therapy technique for your face, you won’t see results immediately, of course. However, many have reported noticeable changes to their midface, jawline, and chin in just 6 months to a year. Also, once mewing becomes an unconscious habit, you won’t even need to think about it anymore: it will just become a part of your mouth’s resting position with the benefits multiplying over time. Since mewing is akin to rewiring your mind to rest your tongue differently, it’s not a fast solution by any means. Instead, it is a therapeutic correction that may in some cases even take a year or more to see results. If you’re correcting a lifelong bad habit you never knew you had, that takes time: so keep at it and you will see demonstrable benefits in your swallowing, breathing, and jawline definition once mewing becomes like second nature. So, in short, be patient. It may take up to a year to see some mewing results. It should be noted also that mewing best works for growing faces, especially in children experiencing puberty. However, don’t be saddened if you’re an adult reading this. Mewing has had success rates in adults as well because the face is far more elastic than we give it credit for. Dr. Mew himself is a practicer of the technique when he first coined it well over a decade ago, having seen results in his own appearance despite having started ‘mewing’ well into his adulthood. However, if you already naturally rest your tongue on the roof of your mouth and still find yourself wanting a more chiseled jawline, there are other options to consider. Mewing is still relatively a passive exercise. There are options for giving your jawline and face the definition you want. For more information on how to better accentuate your jawline, read our comprehensive guide titled: How to Get a Chiseled Jawline. It’s quite surprising actually how many people rest their tongues on the floor of their mouths thinking it is normal. This bad habit may have emerged from mouth-breathing, eating far too many soft foods as a kid, or a whole host of other possible reasons. You probably may have never even considered this a problem until now. Yet, by making a simple adjustment and instead resting your tongue on the roof of your mouth, you engage your entire midface to come forwards. 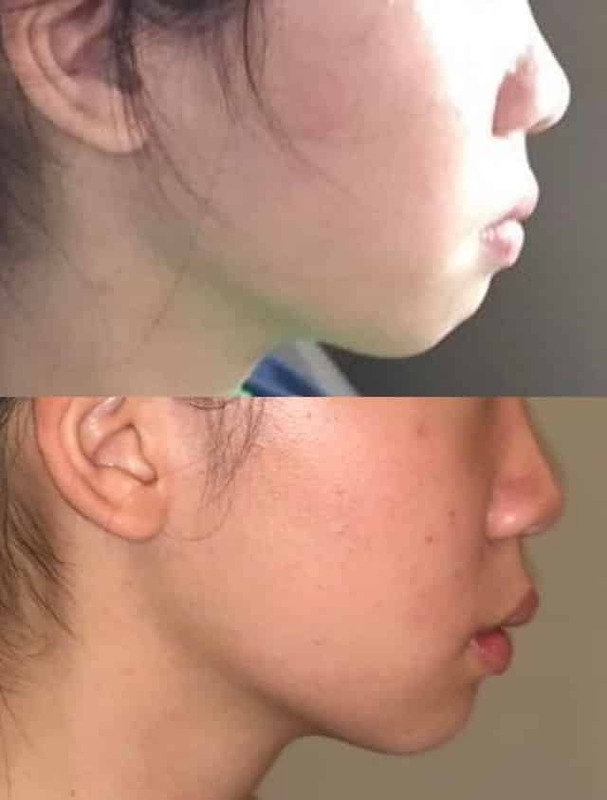 The effects of this simple technique are numerous and they include a healthier mode of swallowing, a slightly more defined jawline over time, and an improvement in posture overall. The main reason this is necessary to begin with is due to the changes during the 20th century which brought processed foods, breastfeeding supplements, and other factors. These made us utilize less of our masticating muscles to our detriment. This naturally caused our tongues to gravitate to the floor of our mouths, thereby obstructing swallowing, breathing, and weakening facial features. It has been found that this problem is especially prevalent in the West which has experienced partly an exponential ‘epidemic’ of patients requiring orthodontic treatment. In fact, the fossil record shows that pre-modern man had far less instances of crooked teeth and facial deformities, unlike today. Resting your tongue on the roof of your mouth is the correct way to develop and balance your face, but unless you’re conscious of it you would have never known. This is why “mewing” has even been called a form of corrective therapy; you are in effect trying to consciously retrain yourself to rest your tongue in the correct position. Mewing is simply the return to the natural resting position of the tongue as it should be. There are a few supplements to try while mewing to keep yourself healthy. These are just some general recommendations which we have found to compliment the benefits you want out of mewing. Vitamin K2 promotes bone plasticity and cardiovascular health (as proven in clinical studies). Vitamin D3 has a direct relationship with bone health. Your best bet would be to buy a supplement which has both vitamin D3 and vitamin K2. Sports Research D3 + K2 supplement with coconut oil (for better absorption) is our recommendation, but this other option by Zhou Nutrition is also a good pick. Magnesium is your best friend for muscle stamina. Pick yourself up some high absorption magnesium so you get the full benefit. B vitamins which will help you body convert more nutrients into energy. This complete formula by Sapien Labs includes B1, B2, B3, B5, B6, B7, B9: the complete B vitamin supplement. Dr. Mew has mentioned chewing gum as a compliment to mewing in many of his videos. By chewing durable gum, you can strengthen your masseter muscle and give your jawline further definition. You should view mewing as fixing the internal orientation of your face which allows jaw workouts like chewing gum to be much more effective and evening. The best gum to chew with mewing is mastic gum. Not only does it boast many health benefits, but it is also incredibly durable even if you were to chew it for days straight. There’s a reason mastic gum was once compared to gold two-thousand years ago; it has been associated with many wellness properties and has been linked to de-stressing, meditative practices. Greek Chios (Xios) Mastic Gum: One of our top picks, this gum is all-natural and practically lasts forever. Krinos Imported Mastic Gum: Made of sun-dried mastic extract, this is another authentic option from Greece. Solaray Mastic Gum Extract: this gum has a higher potency of mastic extract than our other picks. It’s therefore best suited for those also using mastic gum to treat digestive issues. Allergy Research Group Mastica Chios Gum Mastic: Made on the island of Chios in Greece, this gum is also highly potent and could be an alternative to Solaray. Nutricology Mastic Gum: High-rated gum. Plain and simple. Be sure to chew 2-3 hours every day to start. If you feel a soreness in your jaw after chewing for a few days, don’t overdo it: be sure to take a break. However, over time, you will find that this soreness was cease and your jawline will develop more strength. This will in turn give your jawline definition and push your face forward. Some people don’t like the taste of mastic gum, however. Alternatively, you can also try Falim 100 Pieces Sugar-Free Chewing Gum which is just as durable as mastic gum. The texture of Falim gum is similar to regular gum, just much more durable. Falim gum, however, boasts none of the health benefits. The gum comes in many flavors like strawberry, mint, and watermelon. However, mint or plain arguably taste best. Mewing has exploded in popularity within the past year because more and more people are discovering its benefits and posting about it online. There’s been so many videos posted on it in 2018 alone and we expect it to further boom in popularity now that we’re in 2019. Have you had any personal success trying the mewing technique? Do you have any tips or suggestions? Let us know in the comments below. How Often Should You Do Jaw Exercises? Face Yoga Method Review: Is It Worth It? The best online source for jawline exercises, face toning, and all the beauty secrets you need to know to keep your appearance vibrant and youthful.